Marbella in the past, has been unfairly associated with trashy reality TV shows, and tacky, ostentatious displays of wealth. But the town has a lot more to offer than that, including a rich wealth of history and culture. Popularity is on an upward trend, and the tourist numbers are there to back this up. “We had more visitors than we’ve had in history last year and this year could be even better,” says tourist chief Miguel Luna Rodriguez. That´s an amazing turnaround for area that suffered for several years. The micro-climate, provided by the nearby mountains, gives Marbella a more relaxed climate than the rest of the Costa del Sol. People are also attracted by top quality shopping, beautiful beaches, and top class restaurants. Puerto Banus is still a popular area for party goers, but is still an area that attracts some of the most wealthy people in Europe, who dock their mega yachts, and indulge in designer shopping in some of the many boutiques. 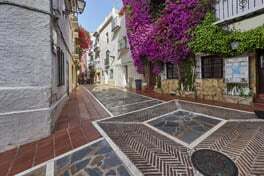 But this image is only part of the picture, as Marbella offers a wealth of history that is worth discovering…. The old town that dates back to the 16th century, offers many interesting buildings, as well as a wealth of boutique shops, and interesting tapas establishments. Orange square is still an extremely popular spot, that´s focal point is the 16th century Governor´s house. When the heat gets too much, respite can be found within the cool stone walls of Our Lady of the Incarnation church, a 17th century former mosque that was taken over by the Christians during the Reconquest. You can find Marbella monuments even older than this, dating from 1AD. The first Roman bridge can still be found beside the Puente Romano hotel and the baths still stand in Guadalmina. You can also tour the town in one of the many horse and carriage tours. Or maybe relax in a chilled public area such as La Constitucion park and the Alameda Gardens. You can easily walk down to the beachfront via Avenida del Mar, and enjoy some of the statues by the iconic, Salvadore Dali – a regular visitor to the area in it´s golden age. The regular Marbella International Arts festival, also brings a regular injection of modern artists, and art that can be purchased. The Starlite festival, is also growing, and now attracts some of the biggest names in music, such as Elton John, and Julio Iglesias. Marbella, like the rest of Spain, is definitely bouncing back to it´s previous glories. A classic tourist destination, that offers history, culture, fantastic cuisine, and some of the best beaches in Spain.